Lauren Nicole Jeffords, of Simpsonville, and Joel Glen Atkins, of Taylors, were united in holy matrimony by the Rev. Russ Shinpoch, during a 2 p.m. ceremony on May 14, 2016, at the First Baptist Church in Simpsonville. Guests were invited to a reception meal held in the reception hall following the ceremony. Flavor-of-your-choice popcorn was offered while wedding guests enjoyed a fun photo booth. 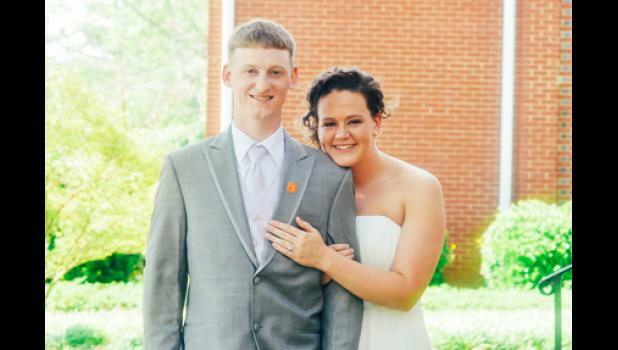 The bride surprised her groom with a Clemson-themed groom’s cake. The parents of the groom hosted a rehearsal dinner also held in the reception hall. They were assisted by Theresa Few, Judy Moore, Lisa Schulenburg and Angel Sheriff. The former Miss Jeffords is the daughter of Mark and Alisa Jeffords, of Simpsonville, and granddaughter of Sybil Jeffords, of Laurens, the late William Jeffords, and Marion and Nancy Hornsby, of Waterloo. A 2011 graduate Hillcrest High School, she completed the University of South Carolina Upstate with a BS degree in Nursing in 2015. She is employed by Spartanburg Regional Hospital. Mr. Atkins is the son of Chuck and Cindy Atkins, of Taylors, and grandson of Geraldine Atkins Gregory, of Taylors, the late Maurice (Bulldog) Atkins, the late Marvin Gregory, the Rev. Gordon Moore, of Easley, and the late Margaret B. Moore. A 2009 graduate of Blue Ridge School, he is currently attending Colorado Technical University pursing a BS degree in Business Administration. The groom is employed by Wells Fargo. Given in marriage by her father, the bride was attended by her sister, Ashley Jeffords, as her maid of honor, and Hannah Jeffords, also a sister of the bride, Rebecca Holmes, Hannah Davie and Ashley Griffith, as bridesmaids. They were joined by Adley Vicars, daughter of Ryan and Rendi Vicars, as flower girl. Mr. Atkins, as his son’s best man, was joined by Joshua Atkins, Derek Atkins, brothers of the groom, Landon Odom, cousin of the groom, and Jordan Smith as groomsmen. Daxon Atkins, nephew of the groom and son of Joshua and Andrea Atkins, served the couple as their ring bearer. Rachel Finley presided at the ceremony as vocalist and pianist. Upon their return from Pigeon Forge, Tennessee, the newly-weds are at home in Ft. Inn.